The story of the Hudson Valley Seed Library reads much like that of a seed itself: accomplishing the extraordinary with very little. Recently, a small group of young farmers and apprentices toured the Seed Library in the last meeting of the year of the Mid-Hudson CRAFT (Collaborative Regional Alliance for Farmer Training) group, to learn about its seed-saving operations. Beginning in 2004, farmer Ken Greene took to the task of saving and cataloguing seeds from the Northeastern region of the United States. Using the model of the classic book-sharing system, like that of the Gardiner Public Library, where he worked at the time, he let borrowers “check out” seeds, under the condition that they would then save seeds so that others could do the same in the future. In plant breeding, pollination is a guided process, requiring vigilant care and specified knowledge of plant varieties and their sensitivities. For a plant to grow to full maturity to produce viable seeds, it needs more resources and support through its life cycle. Most plants have to be covered (the Seed Library uses the lightest-weight row cover) to prevent insects from cross-pollinating species of the same family, ensuring that the seeds offered in their expanding catalogue are consistent. Greene and Muller test the viability of their seeds frequently, and have received lots of feedback from customers about the high quality and germination rate of the seeds they purchase. Contrary to some belief that the Library raises seed for “native” cultivars, their aim is instead to select and breed varieties that are best suited and appropriately acclimated to the bioregion. In the Northeast, this means that plants must be heat and moisture tolerant to withstand the wide range of weather the area experiences. Greene points out that almost none of the plants we commonly grow for food are native to where we live. Only a few decades ago, there were approximately 25 farms in the state that performed the task of raising plant varieties suited to the region; today only the Library and Turtle Tree Seed in Copake do this very important work. In keeping with the sense of diversity and variety they try to establish, the Hudson Valley Seed Library is also unique in the important role that art plays in its activities. The company is known for the “art packs” that they produce, which feature pieces from various artists who are commissioned to showcase, and celebrate, the distinct qualities of each kind of seed the Library produces. Each year Greene puts out an open call for artists–this year over 200 artists applied to design one of the 20 new varieties the Library plans to release. The artwork for the newest varieties is displayed in a traveling exhibition each year. The Library certainly has intention to grow in the future. Greene says that he’d like to someday have 50 acres, to provide for rotational soil management. Currently, with limited space, the cultivation practices are necessarily intensive, but indeed encourage resourcefulness and innovation. This year the Library has invested in a BCS two-wheel tiller, giving up the use of a typical tractor, which proved too large and unmanageable for the Library’s scale. His advice to the group of visiting apprentices was to look carefully at what their future production spaces might need, and address those unique situations with the right technology. 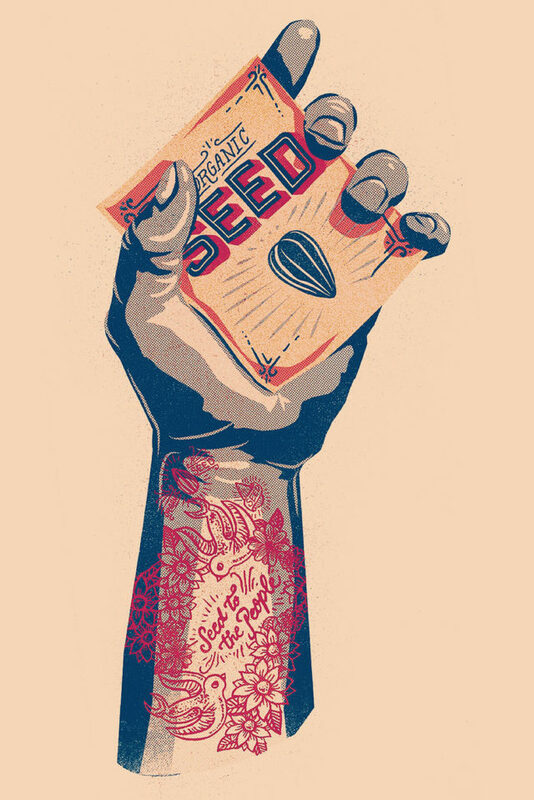 For more information about seed-saving, and to sign up for the Hudson Valley Seed Library’s newsletter, visit their website at www.seedlibrary.org. The CRAFT group organizes tours of various regional farms to offer farmers-in-training the opportunity to visit different operations and network with other farmers and farm interns. For more information about the Mid- and Lower Hudson Valley groups, visit the CRAFT website and www.glynwood.org.